Son of the imperial councillor Johann Caspar Goethe. From 1765 he studied law in Leipzig, but in bored him and he spent much of his time in society. He lived a wild life and afther three years he returned to Frankfurt with a hemorrhage of the lungs and a tumor on the neck. After he recovered, in 1770 he continued his law studies in Strasbourg. In 1772 the son of a preacher named Johann Jerusalem committed suicide. This event was the inspiration for Goethe's "Die Leiten des jungen Werthers" (1774, translated as "Sorrows of Young Werther"). In Sep 1775 Duke Karl August invited him to Weimar, where he was offered a permanent situation as privy councillor at the court in 1779. This appointment resulted in a scandal, since Goethe was no nobleman. Goethe became the friend and companion of the Duke and was became the rising star of society in Weimar. In 1786 he travelled to Italy for two years. This experience made him feel like reborn. In Rome he stayed with the painter Tischbein, with whom he also travelled in Italy. Back in Germany he met Christiane Vulpius in 1788. She went to live with him and bore him five children. In 1789 Goethe became a member of the Berlin Academy of Fine Arts and in 1790 he travelled to Italy for the second time. In Venice he studied art, but this visit was a dissapointment for Goethe, whose love for Italy soon cooled down. 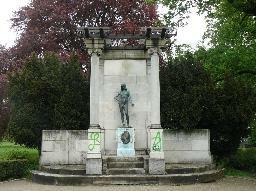 He became the director of the new theatre in Weimar and in that position he was more visible for the citizens. His famous friendship with Schiller started in 1796. They first met in 1794, but after they saw each other again in 1796 a close friendship ensued that only ended with Schiller's death in 1805. Schiller stimulated Goethe's creativity and the latter returned to poetry. Meanwhile, Schiller wrote his great works "Wallenstein" and "Maria Stuart". After Schiller died Goethe completely lost his interest in literature for a while. The French army ransacked Weimar in 1806 and in these troubled days he finally married Christiane on 19 Oct 1806. On 2 Oct 1808 he visited Napoleon, who resided in Erfurt at the time. Napoleon told Goethe he had read Werther about seven times and invited him to Paris. A few days later they met again in Weimar. After Napoleon's defeat in Russia he travelled through Weimar during the night of 15 Dec 1812 and he sent his greetings to Goethe. Goethe was 81 years old when he completed the second part of his dramatic "Faust" on 22 Jul 1831. He had started working on "Faust" 57 years earlier. He died in March of the next year in Weimar. 29/7/1814 Johann Wolfgang Goethe arrives in Wiesbaden. 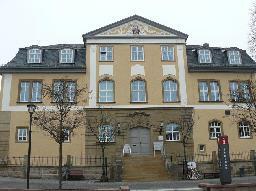 He stayed in Hotel Adler before he moved to Hotel Bären where his friend C.F. Zelter stayed as well. Het met many people in Wiesbaden and he was often invited by Friedrich August von Nassa to dine at Schloss Biebrich. 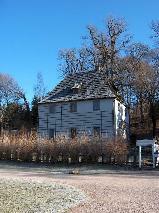 Temporary replica of Goethe's garden house, only a few hundred meters away from the original in Weimar. 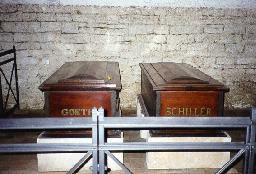 The coffins of Goethe and Schiller in the Fürstengruft at the Friedhof vor dem Frauentor in Weimar. The statue of Goethe and Schiller in Weimar. Goethe's garden house in Weimar. 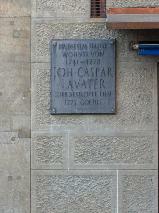 The house where Goethe visited Lavater in Zürich at the Obere Zäune 11. 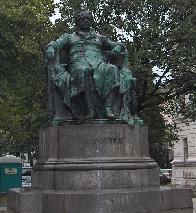 The statue of Goethe at the Burggarten, Vienna. 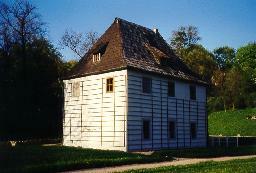 The Goethe museum at Ilmenau. 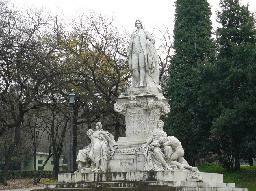 Statue of Goethe at the Villa Borghese Park, Rome. Goethe Memorial at the Schloss-Herrngarten in Darmstadt. 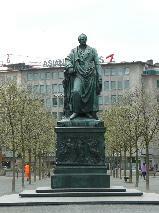 Goethe statue at the Goetheplatz, Frankfurt am Main. 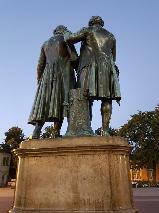 The statue of Goethe and Schiller in Weimar seen from behind.